I'll be honest, I'm not a fan of reggae. Perhaps it's because all I've really heard is "I Shot The Sherriff" by Bob Marley one too many times. This CD contains tracks from Intik (Algerian), Majek Fashek (Nigeria), Maria de Barros (Senegal), Alpha Blondy (Ivory Coast), and Kaïssa (Cameroon) along with several musicians from other parts of the world. These musicians have taken their traditional music and fused it with reggae beats. This is very evident in Kaïssa's track "O Si Keka". If you like reggae, you'll love this album. If you don't like reggae, you will find something to enjoy with all the diverse musical styles. I found this CD to be very enjoyable and am happy to add it to my African music collection. This CD is distributed by Putumayo World Music and a portion of the sales of this CD will be contributed to the non-profit Putumayo Cross-Cultural Initiative. Putumayo World Music has a lot of interesting CDs - take a look at them when you get a chance. 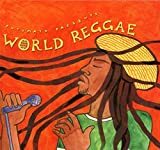 A review copy of "Putumayo Presents : World Reggae" was provided by the publisher free of charge.